Hey dear, In this blog I am going to tell you about some short math tricks which will help you to manage time during your competitive examination. Ans: 18.24 is it correct? Ans: 27.624 is it correct? Now let us come to some short multiplication Trick. 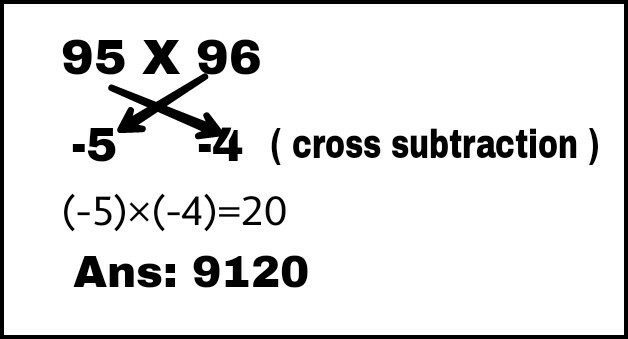 1: Multiplication of two numbers less than 100. Step1: Subtract both numbers from 100. Step2: Subtract 4 from 95 or 5 from 96. The value will be same, i.e, 91. Step3: Now multiply 4 and 5 i.e, 4x5=20. Step4: Now put 91 at LHS and 20 at RHS i.e, . Your answer will be 9120. Is it correct? Lets go to another Trick. 2. Multiplication of two numbers more than 100. Step1: Subtract 100 from both numbers. Step2: Add 6 with 103 or 3 with 106. The value will be same in both case i.e, 109. 3. 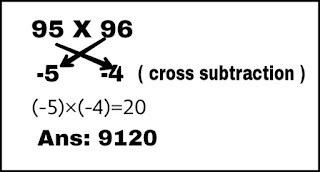 Multiplication of two numbers, one is less than 100 and another is greater than 100. Step1: Subtract 97 from 100 and 100 from 102. Step2: Add 2 with 97 or Subtract 3 from 102. The value will be same i.e, 99. Step4: ( Little bit different from previous method ) Put 99 at LHS and 00 at RHS. i.e,  or this will be 9900. 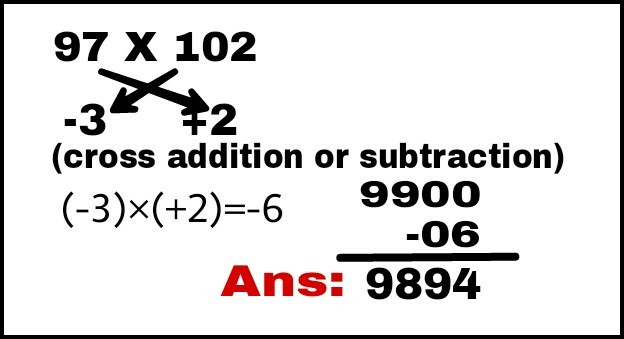 Step5: Subtract 6 from 9900 i.e, 9900-6=9894.This is your answer. These short tricks are seems to be long but after practicing one or two problems it will be easier and less time consuming. You will be able to do it quickly without writing any calculation. 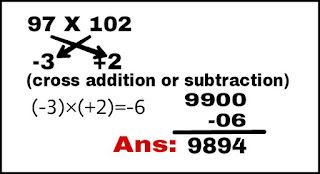 Note: Main part i.e, in second step is to find difference between 100 and the given number. 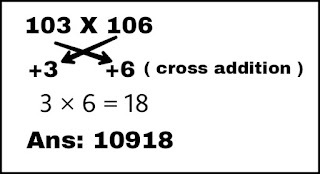 If it less than 100 put minus sign and if it is greater than 100 put plus sign as shown in above picture. Wow! Very impressive maths tricks. I have always maths phobia and solving maths problem in exams. I will definitly use these maths tricks during my exam. I have get some extra math solving ideas from Smile Tutor which is best learning platform for students.